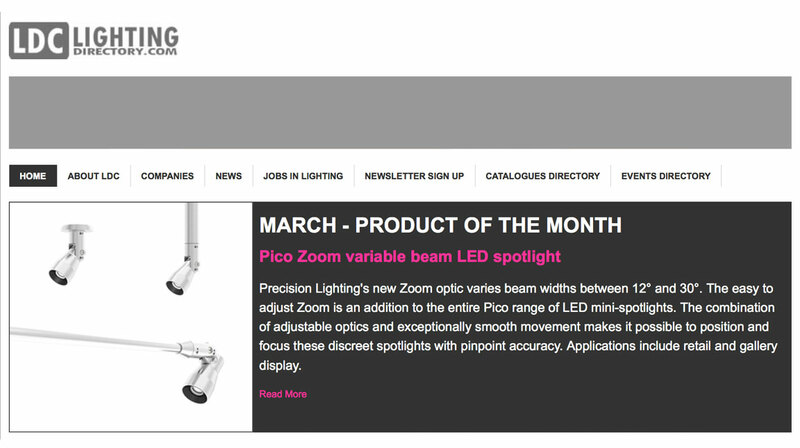 Precision Lighting’s Pico Zoom range has been chosen by the Lighting Directory as product of the month for February AND March. Take a look at lightingdirectory.com to find out more. Precision Lighting’s new Zoom optic varies beam widths between 12º and 30º. Zoom is an addition to the entire Pico range of LED mini-spotlights. The combination of adjustable optics and exceptionally smooth movement makes it possible to position and focus these discreet spotlights with pinpoint accuracy. The variety of mounting options available within the range ensures that all applications can be catered for. The Pico Zoom variable beam LED mini-spotlight system has been shortlisted for the 2014 Lighting Design Awards at the London Hilton on March 20, 2014.